A 20-stone, heavily-tattooed American is helping to promote respect and harmony in Hartlepool's schools. Scary Guy, who had his name legally changed in a US court, is a social evangelist who aims to eradicate hate, violence and prejudice. During his visits he will be driving home an anti-bullying message. 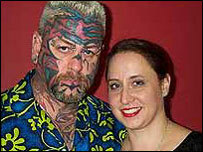 He set out on his mission in 1999 after himself becoming a target due to his multiple tattoos and piercings that give him such a "scary" appearance. He claims his shocking image helps get across the message that what is on the inside is most important. Mandy Thompson, a teacher at High Tunstall School who is co-ordinating the visit, said: "He visited our school last year and the impact he had on the students was so great that we thought it would be a good idea to bring him back to the town so that more of our children could benefit from his approach to life. "His presentations are very powerful and they are certainly giving our youngsters a lot of food for thought. "People often say horrible things to each other. This isn't necessarily bullying, but it can become that. "We hope The Scary Guy's visit will encourage pupils to show respect for each other. "Ultimately, this should make our schools more harmonious places, and improve our children's attainment levels."